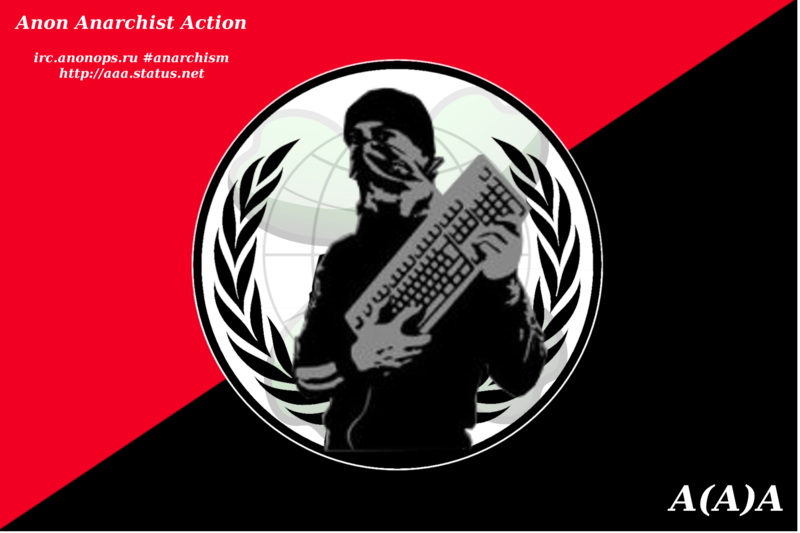 A(A)A is the first specifically libertarian communist grouping to emerge out of Anonymous, the world wide hacking network most famous for retaliation operations actions in late 2010 to the attacks on Wikileaks by the US Government. A(A)A is not a 'split' from Anonymous, but rather a group that works inside Anonymous's decentralised and open structure, focusing on anti-capitalist targets and solidarity initiatives. Possible plans are also being set into motion to enable ways for non-techy anarchists to help with actions, by running a simple program which can then be remotely controlled by the group. Fowever, this is only a possiblity at this point. Before getting involved, it is recommended you take some security precautions. You need to make sure your ip address cannot be tracked (especially in IRC). Also use a different internet pseudonym from your usual one. In the last few years, Anonymous has gained increasing notoriety for its action against websites, agencies and organizations that promote censorship and control. It has helped spread information and supported protestors demanding freedoms and rights. But the popularity of the movement, the attention it brings along, and the structure it has engendered threaten to push Anonymous away from the decentralized, collective movement it has been. As decisions become more centralized and newcomers jump on the bandwagon, Anonymous risks becoming yet another ineffective reformist group, fueled by well-meaning rethoric but subject to third party interests and paralyzed by its fear of authority. This is why we, as members of Anonymous and anarchists, have decided to start an autonomous group to help spread the ideas of anarchism, anti-capitalism, anti-racism and self-organization within it. We want to provide the skills, tools and experience of direct action in the streets, and take advantage of the new resources and techniques of hacktivism. we have retaliated and we have won, we are winning. supporting black blocs, urban guerrillas and the cyber warfare ahead of us. you corporate liars, you greedy money heads... all of this we oppose. We will fight till our end and when we are done, others will follow! This is just the start! As long as we obey, we are open to misdirection. As long as we aren't informed, we are open to lies. As long as we don't control our communications, we are open to manipulation. As long as we aren't focused, we won't succeed. As long as we use for-profit tools, we are slaves to their greed. Free your mind, free yourself! Join us in the biggest yet social revolution that has just started! of Spain, to the Zapatistas in Mexico AND THE ONLINE HACKTIVISTS!! WE WILL WIN there is no other choice, for us, for our next generations, FOR EARTH!